In this blog, we’re providing a list of embedded posts that explain a few Solid Reasons to Buy and Sell in Summit County, Colorado. We share from other sources on our own Facebook page, so please follow us to learn more about the best of Breckenridge has to offer. Did you know we have hundreds of miles of high mountain mining roads and singletrack to explore? Plus, if you do get hurt, know that you’re in a good place to reach high quality care, with our hospital receiving high accolades. And, you’ll travel between Denver International Airport, one of the top 30 in the country. It’s easy to find reasons to want to spend time here, or be able to offer your property to others, we have the resources and the community knowledge to provide you the best recommendations when buying or selling homes in the Breckenridge area. For those considering an investment piece, we are working with local property management companies for revenue projections and property care and maintenance. Securing a proper business strategy is a must for any serious property investment plan. We can help you find the right partners for your property needs. A quick hit list of mountain bike trails to look up include Boreas Pass Road, the Peaks Trail and the Flume Trails. Send us a message with any question about biking in the area. We love riding bikes when we can. The video above shows a familiar scene in April, and that’s snow. Wet and heavier snows fall, but it’s warmer. So it’s melting off faster when the sun comes out. And when the sun comes out, it can feel hot. Well, I think so, at least. And below is a link to an article about why DIA is good to travel to and from. It’s also what helps bring so many families to Breck and Summit. Families visit the Colorado Rocky Mountains with dreams of powder days, dog sled tours and snowshoeing in a snowy forest. And, then in the summer, they want to hike, bike, and fish. But, now we offer so much more and everyone seems to be pretty healthy out here. Everybody is out doing their own thing, and that’s the beauty of it. There’s enough space and opportunity to find quiet nooks and crannies over the years spent up here. It’s great to have so many choices. A major plus is having a stellar Search and Rescue Group, Emergency Personnel and Community Resources when it comes to accident response. Ongoing care with specialists might require a visit to the front range or west to the Vail Valley, but it’s only an hour drive or so. Emotional reasons are easy to bring out, but when it comes down to it, the bills need to get paid. So, click on the article below to read about how Breck is on record pace for STR growth with increasing profits for owners. Ask us about this hot market and how to take advantage of our popular resort area to make the most of your investment. If you’ve made it down the blog this far, you deserve a reward. Thank you for reading, and to share a favorite of ours, head over to downtown Frisco and go to Bread + Salt and have a late breakfast or brunch. It’s so yummy, and in the summer you can sit outside near Main Street with views of Peak 1 and Mt. Royal. 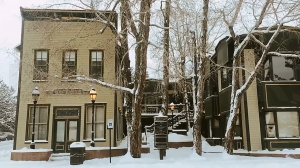 The area of Summit County is very diverse and the different mountain towns each have their own feel. Some properties for sale are downtown and close to all the action, but if remote and quiet is more your style, we can customize a search just for you. There are many neighborhoods near the Town of Breckenridge, so let’s talk soon and we can find your dream home or property. Sometimes you just want to build and get everything you want. It’s absolutely possible. Contact us to learn more. No pressure, we’re here to help you dream and wonder, and to ask yourself, what if you did buy that home in the mountains? What would your life be like then?